Remove/avoid Bad publicity: Elizabeth Mills (perhaps along with Blue Sun: Powering the Future to recycle E.M as many times as needed), Exposé, Rex Campaign, Clone Retirement, Restoring Face, Broadcast Square, The All-Seeing I & Veterans Program all make it possible for the corp to avoid or remove bad publicity which may some of the bite out of rezzing Grim. NOTE: Ireress in most cases basically negates bad publicity on a server IF it isn't broken. 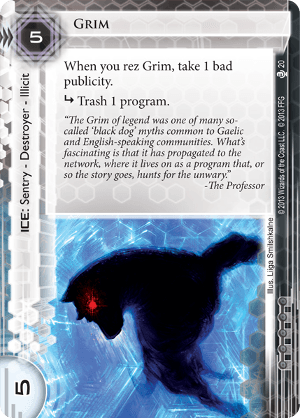 Recycle: In certain circumstances the corp may want to actually trash Grim (get rid of Knight or a Femme Fatale token for example), if so having Blue Sun: Powering the Future could help recover some sunk costs. Corp will still have to deal with bad publicity when re-rezing Grim. Even though Grim has no End the run , surprising the runner and trashing judiciously may effectively end the run anyway and perhaps many future runs while the runner scrambles to repair a gaping hole in the rig. The threat of messing with the runner rig or causing a meaningful tax, on the runner to break Grim may pressure the runner to make less than optimal decisions (considering how killers tend to be the least efficient ice breakers). Without an End the run the corp may still need to rely on other ice to keep the runner out. Forked and (with a few more variables) Forged Activation Orders Parasite etc can trash Grim taking the 5 rez cost with it while possibly keeping the bad publicity to add further insult. At 0 influence cost it makes sense that Grim has been featured on a variety of very successful decks. Usually this includes some combo of bad publicity mitigation. Rig trashing decks can be fun to pilot, however given Grim's owner biting potential, unless your deck is built to withstand some bad publicity, I recommend you invest in a a good muzzle, otherwise you'd be safer considering a pit-bull!